A massive black hole is likely being ejected from its host galaxy according to new data from Chandra and other telescopes. This galaxy is called CID-42 and is located about 4 billion light years from Earth. Data from Chandra's High Resolution Camera pinpoints where the X-rays are coming from - an important clue. A simulation is available to show what astronomers think is happening in this extraordinary galaxy. The galaxy at the center of this image contains an X-ray source, CID-42, with exceptional properties. 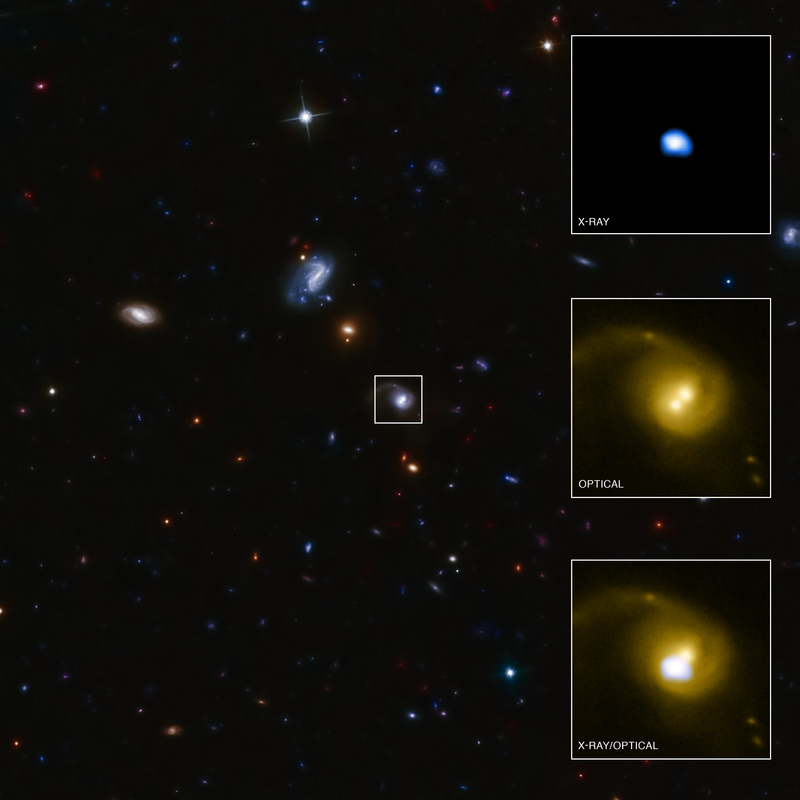 After combining data from several telescopes - including NASA's Chandra X-ray Observatory - researchers think that CID-42 contains a massive black hole being ejected from its host galaxy at several million miles per hour. The main panel is a wide-field image of CID-42 and its surroundings taken by the Canada-French-Hawaii Telescope and the Hubble Space Telescope in optical light. The galaxy is located nearly 4 billion light years from Earth. The outlined box on the main panel represents the more localized view of CID-42 that is shown in the three separate boxes on the right-hand side of the graphic. At the top is an image from the Chandra X-ray Observatory. The X-ray emission is concentrated in a single source, corresponding to one of the two sources seen in deep observations by Hubble, which is shown in the middle inset box. The bottom inset shows how the X-rays align with the optical data in the two insets above. The precise location of this source was recently obtained using Chandra's High Resolution Camera, giving an important clue in telling astronomers what is happening within this galaxy. Previous Chandra observations had detected a bright X-ray source likely caused by super-heated material around one or more supermassive black holes. However, they could not distinguish if the X-rays came from one or both of the optical sources because Chandra was not pointed directly at CID-42, giving an X-ray source that was less sharp than usual. The new data help to clarify the situation. Researchers think that CID-42 is the byproduct of two galaxies that have collided, producing the distinctive tail seen in the upper part of the optical image inset. A simulation by co-author Laura Blecha shows more details of how this spectacular event was thought to unfold. When this galaxy collision occurred, the supermassive black holes in the center of each galaxy also collided. The two black holes then merged to form a single black hole, that recoiled from gravitational waves produced by the collision, giving the newly merged black hole a sufficiently large kick for it to eventually escape from the galaxy. In this scenario, the source with the X-rays is the black hole being ejected from the galaxy. The other optical source is thought to be the bright star cluster that was left behind at the center of the galaxy. 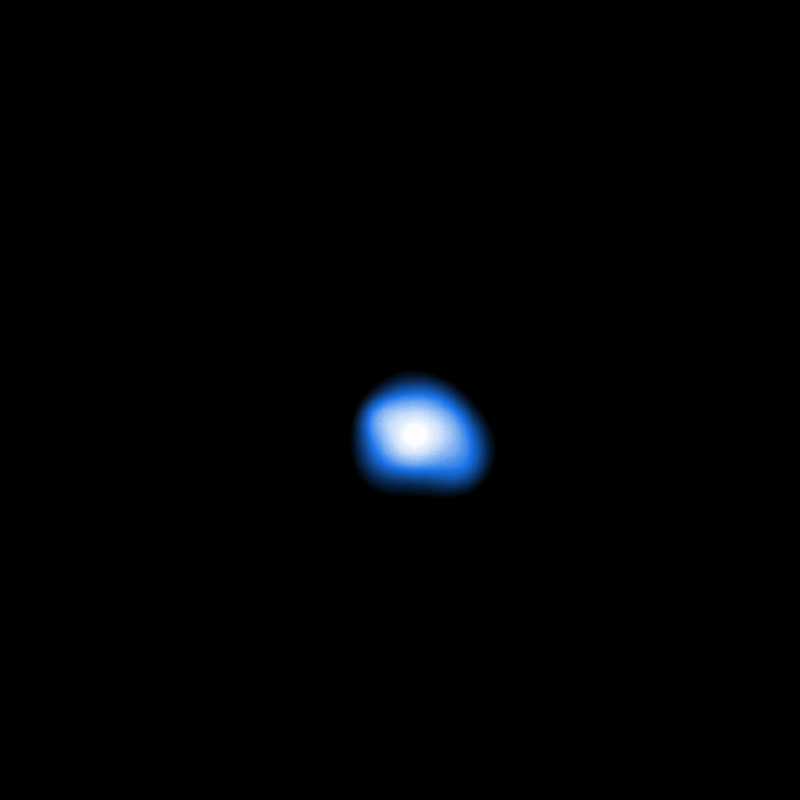 With the higher resolution Chandra data a new feature was discovered in CID-42, a small extension to the lower right of the source. This could be a jet from the black hole or stars forming near it. There are two other possible, but less likely, explanations for the optical data detected in CID-42. Both would involve the presence of a second supermassive black hole in CID-42, requiring X-ray emission from a second source to be heavily obscured. Perhaps something was missed. The ejected SMBH possibly interacted with two other SMBHs. Binary pairs tend to simply merge, depending on trajectory and velocity the presence of a third may better explain the image. I think other sites should take chandra.harvard.edu as a model, very clean and excellent user friendly style and design. Let the content aside, you are an expert on this topic. I believe the black hole is being pulled into another much bigger black hole. It is not being ejected instead think of it more like if our solar system were to lose speed and stop orbiting sagittarius A* we would no longer be able to escape its gravity and we would be pulled straight in. Cavitation: new physics term for me though I observed it frequently. Question: can gravity cavitate? I mean...to some degree its turbulence, but in the shape of a trail. The video was very helpful in demonstrating what occurrs when two black holes collide. Eventually, the ejected massive black hole would have no stars around it and cannot be seen in any light, X-ray or visible. How do we know how many of these solitary black holes are there in our universe? Totally awesome! Thank you all for your work and bringing us into the universe of the unknown and your help in making it known. Congrats and a big thank you.